John Nelson thinks outside the box, as a builder with a big focus on reuse, green building and vegetable gardens (?!?). John has built four houses in the last two years with his small construction company, Northwest Framing & Finish, LLC. His projects have all taken place in Bellingham. His most recent project is a 1,400 square foot spec house he is building in the Sunnyland neighborhood. It will have many green features including solar panels, waste water heat recovery, rainwater catchment and a high level of energy efficiency. First, he had to remove the funky 700 square foot 1930’s cabin that had occupied the site. He contracted The RE Store to remove all of the salvageable building materials that could be stripped out. Salvaged supplies included siding, flooring, doors, cabinetry, a clawfoot tub, and a classic armoire. “Reuse is crucial. As a builder, I use materials from The RE Store every time I build a house,” said Nelson. John finished the deconstruction of the existing building, salvaging lots of 1930’s framing lumber. Some of the 2x4s that were saved were vertical-grained Douglas fir, well-seasoned after over 70 years in the walls of the building. T and T Recovery was a partner in the project as well, recycling all of the non-salvageable materials. 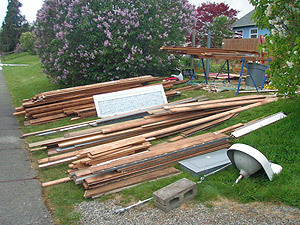 Their services are one of the premier construction debris recycling service in northern Washington State. As a result, zero percent of the building went to conventional disposal. As a result of John’s green demolition and building practices, he was the first builder to receive the expedited “bin bump-up” building permit that is being offered as a pilot project in 2010 by the City of Bellingham. The City worked with Sustainable Connections and the Whatcom County B.I.A.’s Built Green program to establish this new incentive for builders. The permit gives seven days for review rather than the 30 days or more for review by the Bellingham Planning Department. The pilot project will run for seven months, being reviewed in October, 2010. One of the most interesting things about this green builder is his commitment to creating places for gardening. John has installed a garden that will feed the needy until its new owner moves in and eats a home-grown meal on their first night. Is it a green dream or a just a progressive way to meet a changing real estate market: a salvaged building, a green-built home, and an abundant garden. His list of interested buyers speaks for itself. Green salad anyone? For more details on the project, visit the building owner’s blog.